To allow ample time for all patients and scheduled surgical procedures, we operate primarily by appointment, however, walk-ins are welcome. Emergency cases shall always receive top priority, which is why occasional appointment delay is inevitable. Please realize that we make a sincere attempt to see each client on time. For your convenience, 'drop-off' appointments are available. A 'drop off' means you could bring your pet at the time that works best for you and leave him/her with us for a couple of hours. Usually we will ask you to drop off sometime in the morning so our doctors can examine the patient in between appointments or at the time purposely reserved for admitted patients. Once the doctor is done, she will give you a call to go over the diagnosis and to give you discharge instructions. CareCredit is a service that, if you are approved, will extend you a line of credit for medical expenses. Using CareCredit, your bill can be paid over six months interest-free. Various payment plans are available. We can help you fill out the application, which is typically approved within minutes. This method of extended credit provides you the opportunity pay for services over several months. 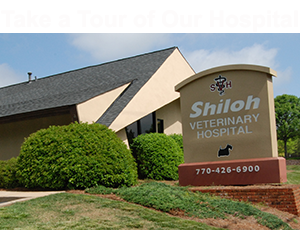 At Shiloh Veterinary Hospital we understand that there may be times in which your pet’s medications may be obtained from alternative sources other than our hospital. We do not recommend purchasing your pet’s medications from unknown online pharmacies. Please talk with us first before purchasing your pet’s medications from another source. You will find our in-house pharmacy prices are very competitive with online pharmacies. Please be aware that you pet is required by law to be examined at least once in the past year to continue to refill medications. We recommend spaying or neutering every non-breeding pets, and we recommend spaying or neutering your non-breeding pet around 6 months. This recommendation may vary based on each individual pet. Please schedule an appointment to discuss spaying or neutering your pet with one of our veterinarians. Vaccines are an important part of your pet’s health care. Vaccines keep your pet healthy and prevent serious diseases. We will make sure your pet avoids these serious diseases through a vaccination schedule based on your pet’s lifestyle, health, exposure to other animals in kennels and urban dog parks, your pet’s risk of preventable diseases and other individual circumstances. The first Rabies shot your pet receives is good for 1 year. Subsequent canine Rabies vaccinations immunize your pet for 1 - 3 years depending upon the vaccine your dog receives. Dogs are required by Georgia State Law to be vaccinated against Rabies. For cats, we use feline-exclusive rabies vaccines which are good for 1 year. It is important to prevent fleas. We recommend all dogs and cats be given a monthly flea preventive all year long. Not only are they uncomfortable for your pet, fleas are also carriers of disease, such as tapeworms. There are many medications for the treatment and prevention of fleas. Some medications are in a combined form with the monthly heartworm medication. Not only is this convenient, but it reduces the cost of two medications! Many of the pets that visit us on a regular basis need professional teeth cleaning. When bacteria irritate the gum line, the gums become inflamed in the early stages of dental disease causing gingivitis. Left untreated, this leads to periodontal disease which causes the loss of the bone and gingival support structure of the tooth and subsequent tooth loss. In addition, the bacteria are consistently released into the blood stream allowing for systemic infections, which can cause damage to internal organs, such as the kidneys, liver and heart. A dental exam is a part of any physical exam at Shiloh Veterinary Hospital. Please do not feed your pet after 8:00 p.m. the evening before a scheduled procedure. There is no restriction on drinking water that evening, but the water bowl should be removed first thing the morning (6:00 a.m.) on the day of the procedure. Plan to arrive at the office at the appointed time and allow 15-30 minutes for check-in procedures. At Shiloh Veterinary Hospital we take all anesthetic cases very seriously. We utilize the safest, multi-modal approach that is individually created for each dog or cat. It includes injectable medications for sedation and pain management as well as gas anesthetic agents. The combination of pre-anesthetic assessment of your pet (including blood work), use of modern anesthetic agents, and the latest anesthetic monitoring equipment means that anesthesia is generally considered to be a very low risk for your pet. Physical Exam: Your pet will receive a thorough physical exam before anesthesia. Lab work: Before every anesthetic episode, we recommend a complete blood count (CBC) and serum chemistry. The CBC will allow us to screen for signs of infection, anemia, and indications of coagulation problems. The chemistry is mainly used to screen for liver and kidney problems, which are the organs that metabolize and excrete the anesthesia. Other health problems can be detected, as well. Choices of Anesthetic Agents: At SVH, we offer the most modern choices in drug choices for anesthesia. Each pet is an individual, and drugs are chosen on an individual basis, based on health, weight, and breed. Intravenous Catheter: At SVH we prefer an IV catheter be in place for all surgeries. This allows easy administration of drugs to induce anesthesia, administration of fluids during surgery, and access to a vein to give emergency drugs quickly, should a problem arise during surgery. Monitoring during anesthesia: Detecting a problem early is the best way to prevent more serious problems. Our advanced anesthesia monitoring devices will monitor your pet's vital signs, including heart and respiration rates, ECG, and pulse ox, during surgery. A trained assistant will be also be present to subjectively monitor your pet's anesthesia level. At SVH, pain management is a requirement not an option. Pain is best managed if pain medications are given before the pain starts. Therefore, your pet will receive an injection for pain prior to surgery, and you will be sent home with a prescription of pain medication. DO NOT give over-the counter pain medication without first contacting your veterinarian. While some can be given, some human medications can be fatal to our pets. Some human medications cannot be mixed with medication we commonly give to our pets. What is the follow-up care after surgery? For most procedures, the after care will consist of confinement for 10-14 days following surgery. This means no running, jumping, or playing. Leash walks to go outside to the bathroom is allowed for dogs. Baths should not be given. You will need to monitor the incision for redness, drainage, and swelling which could be an indication of infection. Some redness and swelling will be normal with healing. We recommend no food the night following surgery, but your pet should be able to eat and drink as normal by the next day. If your pet vomits, has diarrhea, or is not eating, please contact our office. If you notice your pet licking at the incision, your pet will need to wear an e-collar. If you do not have one, pick one up immediately. If your pet has stiches in the skin, you will need to return to our office to have them removed 10-14 days after surgery.